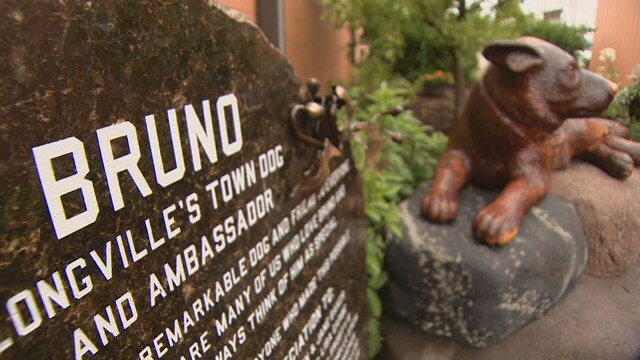 Bruno the dog has become an iconic resident in Longville, Minnesota, thanks to his daily 4-mile trek into town to meet and greet with the locals. For 12 years, the town mascot has made his way up Highway 84 just shortly after sunrise. He takes time to stop by local shops and cafes, getting in time with the local populace before he hitches a ride back to Debbie and Larry’s house for the night. Sometimes, he stops into offices and shops, sitting a while and visiting with the owners and workers. He’ll spend as much as 2 hours or so with them, where everyone feeds him treats, gives him many pets, and cools him off with water. He even makes a pit stop at the local butcher at the end of the day where he’s rewarded with scraps of meat they’ve saved for him. The LaVallees say that people who are new in town or visitors to the community will often call them to tell them their dog’s gone missing and are often dumbfounded when they reply that he’ll find his way home at the end of the day. Bruno always does. Because he’s able to dodge traffic so well, some have said they believe he has a guardian angel watching over him. Not once in his 12-year career has he even come close to an accident (at least not witnessed). And since he’s so well known, residents know to look out for him on the road. The town has appreciated Bruno so much that there’s already a wood carving of him, immortalizing him in a park on the town’s main street. He has been forever dubbed as Longville’s town dog and ambassador.